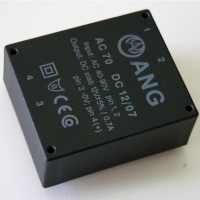 ANG company manufactures switching power supplies with universal input range. This supplies has input EMI filter and short-circuit protection. The combination of low ripples, high efficiency, coated, waterproof shell with small dimensions and high reliability makes ANG power supplies preferred by most Internet providers. There are three basic types of power supplies divided by a input voltage: AC40 (25V-70V), AC70 (40V-90V) and AC220 (185V-245V) with different output voltages and currents. Thanks to the great experience over the years, the company offers consulting and development of new switching power supplies for the needs of the client.